Excerpt From AWS Welding Journal | Weldtech Training Inc.
Welding Training Programs & Courses Weldtech Training, Inc., Mississauga, Ont., Canada, has developed a training program and conducted testing to the requirements of AWS D1.3, Structural Welding Code – Sheet Steel, geared toward Canada’s automotive industry. 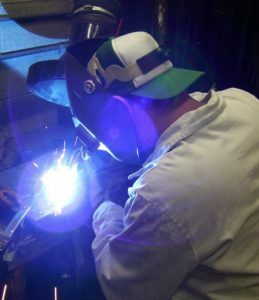 Even though many automotive manufacturers have their own internal standards and training, some members of the industry decided that welder qualification through an internationally recognized organization such as the American Welding Society would act as a good benchmark standard for manual gas metal arc welding operators. The test Weldtech developed includes fillet welds and plug welds in the vertical and horizontal positions on 1.3-mm-thick, coated automotive grade steel. All welds have to pass visual inspection and then destructive testing. According to instructor Jim Murphy, this is the first application of AWS D1.3 qualification in the Canadian automotive industry. Several groups of workers have taken the training and been tested. Companies participating have included Daimler Chrysler, Honda, and Magna International.